Exercise therapy studies in persons with multiple sclerosis (pwMS) primarily focused on motor outcomes in mid disease stage, while cognitive function and neural correlates were only limitedly addressed. This pragmatic randomized controlled study investigated the effects of a remotely supervised community-located “start-to-run” program on physical and cognitive function, fatigue, quality of life, brain volume, and connectivity. In all, 42 pwMS were randomized to either experimental (EXP) or waiting list control (WLC) group. 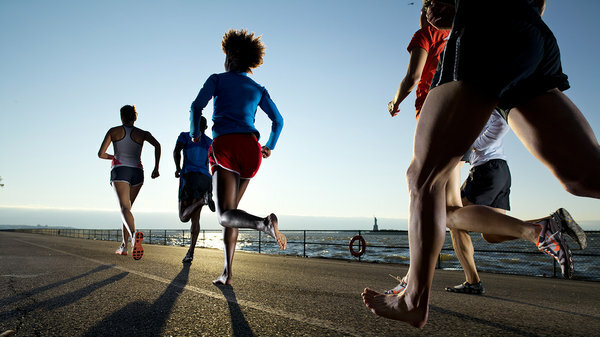 The EXP group received individualized training instructions during 12 weeks (3×/week), to be performed in their community aiming to participate in a running event. Measures were physical (VO2max, sit-to-stand test, Six-Minute Walk Test (6MWT), Multiple Sclerosis Walking Scale-12 (MSWS-12)) and cognitive function (Rao’s Brief Repeatable Battery (BRB), Paced Auditory Serial Attention Test (PASAT)), fatigue (Fatigue Scale for Motor and Cognitive Function (FSMC)), quality of life (Multiple Sclerosis Impact Scale-29 (MSIS-29)), and imaging. Brain volumes and diffusion tensor imaging (DTI) were quantified using FSL-SIENA/FIRST and FSL-TBSS. In all, 35 pwMS completed the trial. Interaction effects in favor of the EXP group were found for VO2max, sit-to-stand test, MSWS-12, Spatial Recall Test, FSMC, MSIS-29, and pallidum volume. VO2max improved by 1.5 mL/kg/min, MSWS-12 by 4, FSMC by 11, and MSIS-29 by 14 points. The Spatial Recall Test improved by more than 10%. Community-located run training improved aerobic capacity, functional mobility, visuospatial memory, fatigue, and quality of life and pallidum volume in pwMS.